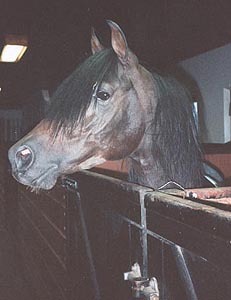 This is a stallion from the US leased by Slängsboda. He was then owned by Maplewood. His mother *Galia was imported in utero to the US, she was by Chazar out of *Gielda (*Gielda's first foal). *Gielda' dam *Gontyna was exported to the US and is also the dam of the stallions Brusally Gwiaztyn by *Gwiazdor and Brusally Orzetyn by *Orzel and the mares Brusally Zbruyna by *Zbrucz, MS Galena and MS Dynastie by *Bask. The damline is that of Sahara OA, a Kuhailan strain. Sahara was imported in 1845 along with Gazella OA and Mlecha OA to Jarczowce. The only direct line from Sahara OA is that from her daughter Sahara Slepka OA who was foaled in transit. Many members of this family perished in World War I and only two mares were saved, Pomponia 1902 and her daughter by Kohejlan OA, Zulejma 1914. After the war Pomponia had two more daughters, Dora 1922 by Bakszysz and Bona 1920 by Mazepa I. Of the postwar daughters, only Dora had any impact on the breed. The branch that Gotcha belongs to is that of Zulejma 1914 through her daughter Ferja 1924. Ferja's daughter Norma 1932 produced Gazella 1946 (full sister to Nureddin and greatgranddam of *Galia) and *Enorme, dam of the circus stallion *Erystawi. *Erystawi was imported to Sweden at the same time as Nureddin. *Gontynas full sister Gehenna was exported to the UK and is the dam of *Dido by *Grojec who was imported to Sweden. *Dido left only one daughter in Sweden, Egina. Beside Gotcha, *Galia produced his full sister Gambria. 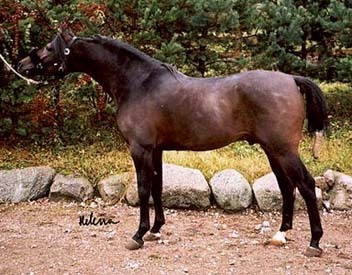 *Galia was sister to the mare Gladyszka by *Eter.